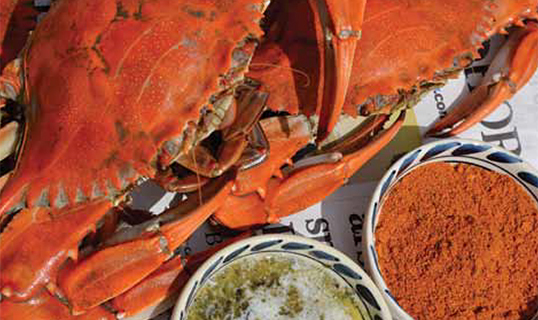 Our Steaming Spices leave your kitchen smelling heavenly without imparting a spicy flavor to the crabs. Offer your guests the choice of herb butter or our spicy Chesapeake Bay Seasoning while enjoying the sweet, sweet meat. Add 2 tbsp. Steaming Spices to 2 or 3 inches of water in a large steaming pot. Place a steaming rack in the pot (to keep crabs above water level), then bring water to a boil. Carefully place live crabs in the pot, using long tongs, then cover as needed to avoid active claws. Cover with tight lid, and steam for about 15 minutes or until crabs are bright red. Remove from heat, and place crabs on newspaper or trays. Allow to cool. Chill in refrigerator or ice chest. Serve picked crabmeat with a butter made with our Herbs for Seafood, spice things up with Chesapeake Bay Seasoning, or make crab cakes.